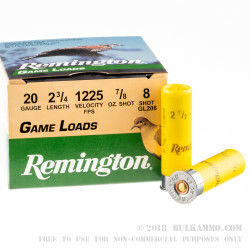 This 20 Gauge shotshell from Remington’s Game Loads line of ammunition is loaded with 7/8 ounces of #8 lead shot. 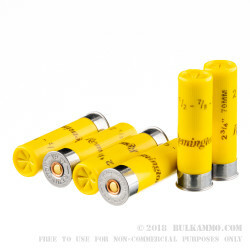 This is a great selection of shot size if you’re going to spend a day flushing grouse, dove, or quail from their hidey holes in the brush -- the just over 350 pellets in this shell create a great spread in which to ensnare such flighty targets from about 100 feet out, but lacks the substance to turn them inside out. 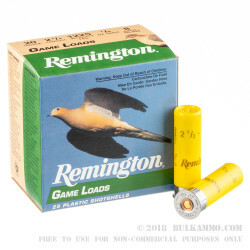 Remington’s lead shot is hard and spherical, so this shell will give you the accuracy you need to enjoy fine upland game hunting. 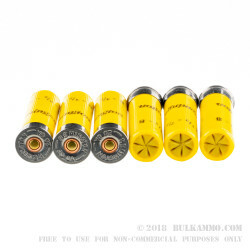 Game Loads ammo is very affordable, but not at the cost of quality. You’ll find that this shell’s wad patterns remarkably consistently, a great compliment to its well-made shot. Its hull will serve you well should you choose to reload it, and its propellant burns evenly and clean to give you a bar none shooting experience in the field.